Here's a pattern I made for an amigurumi cloud. It is easy to crochet, but a bit hard to explain. Because of this the pattern involves a bit of counting... Once you get the hang of how the increases and decreases line up, though, you can forget the counting. Because all the inc and dec have to be in line (on the top of the cloud), they don't actually really follow rows, but I think the pattern is easier to understand this way. So if the instructions for a certain "row" stop in the middle of the real row or go on to next row, don't panic, this is meant to be! If you have any questions , don't hesitate to ask! Also, you should stuff as you go, so that all the bends will get enough stuffing. Sc 6 times in the second ch from the hook. Sc dec once, sc in the next 10 sc. 3sc in the next, sc in the next 10 sc. 3sc in the next, sc, 3sc, sc in the next 13 sc. 3sc in the next, sc in the next 16 sc. 3sc in the next, sc, 3sc, sc in the next 19 sc. 3sc in the next, sc in the next 22. 3sc in the next, sc, 3sc, sc in the next 25 sc. Sc in the next 25 sc. Sc dec twice, sc, sc dec twice, sc in the next 20 sc. Sc dec, sc, sc dec, sc in the next 19 sc. Sc dec, sc, sc dec, sc in the next 17 sc. 3sc in the next, sc in the next 18 sc. 3sc in the next, sc, 3sc, sc in the next 18 sc. Sc in the next 24 sc. Sc dec twice, sc, sc dec twice, sc in the next 14 sc. Sc dec twice, sc, sc dec twice, sc in the next 10 sc. Sc dec twice, sc, sc dec twice, sc in the next 11 sc. 3sc in the next, sc in the next 22 sc. Sc dec 8 times, stuff, sew shut. EDIT: A lot of people seem to have trouble with this pattern, so I made a step-by-step tutorial on how to crochet one, with pictures! 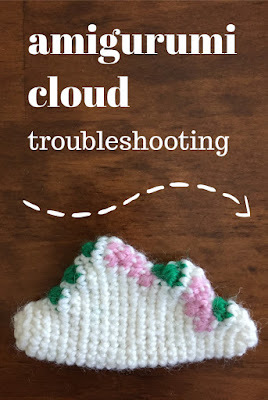 So hop over to the post about amigurumi cloud troubleshooting. Hopefully you'll find it helpful! I love this! I'm thinking of making an amigurumi mobile and this would be perfect on it! Thanks for sharing. J'aime beaucoup votre blog !!! You're welcome:) I'm glad you enjoy! I stuck eyes and embroidered a smile on them. I'll take pics later. Your cloud looks so cute! The face is just perfect! They are so levely ! I'll try it very soon ! these are soO0Oo totally kyoot!!!! I feel like there are some inaccurate stitch counts in the pattern - rows 6, 8, 10, 11, 12, 13, 14, 15, 18, 19, 20, 21 & 22 cannot be accurate as written above considering they do not agree with the rows directly before and after them. I have typed out a correction - let me know if you're interested! I agree! I found this very confusing when I was making one of the clouds. I found the best way to do it was to ignore the stitch count at the end of each line of instructions. Just follow the general pattern and it works. i dont get what you mean at the first part,help please!!!!!! Okay,I made this cloud but not yet the sun.I'm going to make it and make a lot of clouds.I might make a little thing that when a baby is in the cradle and is looking at it -a mobile-wait,no i can't!!!!!!!!!!!! Brooke, did you read the bit about "the instructions for a certain "row" stop in the middle of the real row or go on to next row"? I had a really hard time writing this pattern (and English is not my native language), so maybe I've explained it poorly? However, there can easily be a mistake in the pattern:) Feel free to post the corrections in the comments, thanks! Thank you everyone for your comments! Please post links if you have pictures! my englich is not so good ! I'm so sorry ! I'm a french woman ! I would like to know if it's posible to me to translate it in French with a link to your site (here) ? Stéphanie, my English isn't that good either! :) I hope the pattern works for you, feel free to translate it. Nice article as for me. I'd like to read a bit more concerning that theme. Thanx for giving that information. Hi! I just made this cloud, and I totally love it! You are so creative, and your directions are wonderful. Thank you so much! P.S. Have you heard of Ravelry.com? If not, you should join and add your patterns there! I'm sure they will be a big hit, because they are so cute! Dagmar: Thank you, I'm glad you liked the pattern! I do have a Ravelry account actually, I just got lazy and never posted anything there... I have to look into it again, thank you for reminding me! Hi! I made both your cloud and sun pattern. I have yet to put a face on the sun, but they both ended up adorable and I thought you might like to see them! I think I am eventually going to make a mobile out of them when I get the time. Thank you so much for the pattern! They are well written and so very cute! So cute! Thank you for sending me a link, I'm glad the patterns worked for you! i just found your blog and am in love!! your work is wonderful. I have been struggling with making a cloud to go with a rainbow and raindrops - this looks perfect! I can't wait to try it today. Thank you! Rainbow and raindrops sound absolutely wonderful! Do you have them on your blog? I'd love to see those! No problem, S! :) I'd love to see how yours turns out. Hiskia, your cloud is so cute, I love the face! I'm sorry the pattern is a bit freaky... I think the most important thing is just to make sure all the inc and dec line up. super sweet cloud, but when I tried it I produced a kind of weird looking carpet! :( You think you could make a short video of the first 5-7 rows on youtube? Thanks again for posting this, it is the cutest!! Aww, Erinn! I absolutely love those! This is so cute. I'm lost though. I made it and my bumps on the cloud are off. One is on top and the small one ended up on the back. Help please!!! I think you mean where instead of were in your description, fyi. Ohhhh! Thanks for this lovely pattern! hi! my name is caroline and i am a teacher from Belgium! i really ADORE your clouds and sun. i'm making them right now and i'm planning on using the in my class. They can help my children to talk about the weather. I'm sure they'l love it too! Thank you verry much for your free patern! hello, i'm chloe from korea. i like your work very much, especially this cute stuffed cloud. i'd like to refer your pattern on my next knitting book. i'll comment your name as Riikkael under the pattern. but i tried your pattern in practice, there were few problems with this counting crochet stitches. i recounted and remade the pattern. plz, refer my new pattern. and if you have further questions, feel free to contact me to "salondechloe@gmail.com". 1. Sc 6 times in the second ch from the hook. 11. Sc in the next 27 sc. 17. Sc in the next 25 sc. 22. Sc dec 8 times, stuff, sew shut. I think there might be a possible error in row 10. When I follow the directions I end up with 29 stitches total instead of 27.
i waited your reply, but there wasn't..
i'm working for a whole new cloud pattern now. and the whole new pattern will be in my book. i'll link the picture of the new cloud someday. Haha, that's awesome! I love My Little Pony! Brohoof, my friend. :D Brohoof. outstanding! I find the articles you provide here are interesting and worth to read. Great share thanks for the read! This pattern is adorable but don't bother with it, IT DOES NOT WORK. I have tried it multiple times and it just does not come out correctly. I even tried the corrected version in the comments and that didn't work either. Soooo... find something else, don't waste your time. Aww, I'm sorry. A lot of people seem to have trouble with this one. I recounted the pattern again and just can't find a mistake, I think it's just the crazy way the pattern is written in that's so confusing. Sorry about that! It does work! Lots of people have made one and commented on how nice they are, including myself! Super cute cloud! Made it tonight within an hour. Got a little off center on top, but its a cloud, it doesnt have to be perfect! Hey, that's great! And I'd love to see the face! I am such a plonker... followed your wonderful pattern just fine and then must have miscounted towards the end. Stuffed it regardless, the cats love their new toy! Looks a bit like a deformed cauliflower, much to the amusement of my boyfriend who will sleep on the couch tonight. Fresh start tomorrow, thanks so, so much for the pattern! I have several attempts to make the cloud. I failed. I had an eye on how it works. With my common sense, it succeeded. Because I wanted to make more clouds I've written for myself. The pattern is on my blog. www.lutjehaakt.blogspot.com In the Dutch language. Hi, there, I'm from Argentina, I'm trying to make these lovely clouds, but I fail all the time. So I wanted to ask you if I have to crochet both sides of the starting chain or is just in rounds? Thanks you so much. Hi!!! I love this pattern, thank you for sharing it with us. It's easy and cute. I made a mobile too!! Luciana, podrías pasar el link nuevamente? Da error... Gracias!! Oh, lovely! I might have to try that! Thanks for trying out the pattern! They look really cute! I love the white cloud with colorful raindrops! Hi ! I wanted to know .. can I post this pattern in my blog ( translated into estonian ) ? Yeah, the pattern is a bit crazy. If I was to write it now, I'd try to follow actual rounds. Glad it worked out for you in the end! I love this pattern! I am fairly new to crochet, but would love to make this pattern for my wall! I was wondering if you could give me some advice on how to make this cloud way bigger to use it as wall art? I'm wondering how to alter the pattern but have it still work. Hmm, I'm not sure. For a wall you'd want it to lay fairly flat, so, I'd say, just add more stitches and more rounds where you increase. So instead of increasing in 5 consecutive rounds increase for 20 rounds, or however big you want it to be. And use thicker yarn! Some on here did a bigger one so maybe they have better ideas? Good luck and let me know how it goes! Thanks a lot for the pattern! I've started my first cloud yesterday and pattern is easy and clear!! I want to make a mobile like you suggested, it is adorable!! it's so cute!!! I will try it!! Hi, I am having a hard time making the cloud correctly. I followed the directions exactly as they are written and I ended up with on bump on the top, and one on the side...I have tried re-doing it four times, and it keeps turning out wrong. Do you have an updated pattern, or one that is a little more descriptive? Thank you! Sorry about that. If counting doesn't work for you, just try to line up the increases and decreases. For example, if you 3sc, sc, 3sc on the previous round, 3sc into that middle sc on the next. Then on the next round 3sc both into the first and third of the 3sc of the previous row. They should make a nice line on the top of the cloud. I tried this pattern and very much failed, but I'm definitely going to try again. If the increases on supposed to be on top, does that mean that the decreases should be on the bottom? I just made this...and I don't know if it's just me...but for some reason it doesn't look the same. :( It still looks alright though. Kiitos! Hienolta näyttää sun pilvi, tykkään noista pisaroista! many thanks!!! ^^ bisous from France! hello, I have just made another cloud with your wonderful tutorial! if you want to see, they are on my blog, many thanks again ! ! ! Did you use the same hook for all of the pieces? What size did you use? :) Planning to recreate for a baby shower next month! Saisiko ohjeen suomeksi. On en oikein tuota lontoon luhennyksiä ymmärrä, että missä lisätä ja missä kaventaa.? I have just finished my first cloud and it came out perfectly! I just followed the pattern without taking into account the rows,thanks a lot!! I just tried it and it didn't come out so nice. Is it supposed to be rows or rounds? My cloud didnt look much as a cloud when I finished, so sadly I must have done something wrong. I was wondering what you mean by "if the instructions for a certain "row" stop in the middle of the real row or go on to next row, don't panic, this is meant to be"
-are you just suppose to continue, should you turn your work or what? I mean, if it is meant to be, what are you suppose to do? MUITO OBRIGADA VOU TENTAR!!!! VC NÃO TEM EM VIDEO?????? Hello! Would you mind if I sold a finished product that uses your pattern? I would link back to this page on my blog :). Thank you so much for the pattern! I love Eeyore. My daughter gave me a key chain with eeyore and I decided to make a window decoration for the RV we live in full time. Your pattern was perfect in mohair as eeyore’s storm cloud with pink and gray crystal raindrops! I’d love to show it to you but can’t figure out how to paste the pic! Thanks again! I'd post a pic, but not sure how? This looks awesome! Im trying to put a cloud on top of a pokemon called Drifloon. Think this will look right? Thanks for the pattern. The instructions are confusing as the number of stitches are incorrect. They come out nice, a little bit small so I just added some rows and made them bigger. Thank you again! Do you love crafting? ME TOO! My name is Riikka. I live on the West coast of Finland. Married to Jake, mother to a baby girl. Chronicling my escapades in crafting and thrifting since 2008. If you make some please leave a comment, I'd love to see them! You can also send me an email at riikkael at gmail dot com or tag me on Instagram @jumbleofinterests. Visit Riikka-Elina Rissanen's profile on Pinterest.